Is There Just Cause 2? 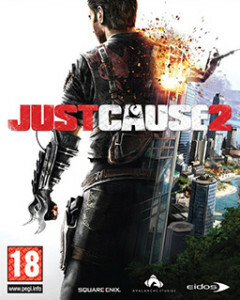 Just Cause 2 is an open world action game by Avalanche Studios that takes place in the fictional foreign country of Panau. I picked it up because it was cheep. Is it worth the $10 dollars? Yes it is. The game starts off with the hero Rico Rodriguez in a helicopter being told about the political situation in Panau. Basically it was US friendly, but recently it has taken a bad turn, so your job is to destabilize the country, so someone new can take over, and the way you do that is to use your awesome grappling hook to steal helicopters to blow the government’s stuff up, or what ever else you want with whatever else you can find. You can do missions for some major rebel forces if you want, or you can just cause Chaos freestyle, and Chaos is capitalized because you get Chaos points for the crazy stuff you do, and the more Chaos you cause the more cool stuff you unlock. Your major weapon is your grappling hook. It pulls bad guys off towers, allows you to skyjack helicopters, or just about any other moving vehicle you could want. You can also buy weapons and cars off the black-market and have them dropped at your location. It is a crazy fun game that rewards you for the crazy fun stuff you can do, and unlike other games, the entire world is open to you from the start so can really just have fun the way you want to. It is a great game that you can find at an even better price these days, so if you haven’t played it yet, you should add it to your list. Previous PostPrevious Lets Have Some Adventure Time! Next PostNext My Favorite Star Trek Movie: First Contact!